← Germain Grisez, Rest in Peace !!! No one, it seems, can resist the lure of the money available in the great market of China, for deodorants, cars — or congregants. Not even, or especially in these days, the Vatican. On Feb. 1, the same day that new repressive regulations of religion went into force in China, the Vatican took a deep bow before Beijing. After long resisting, it finally agreed to recognize several hack bishops designated by the Chinese Communist Party (C.C.P. ), even sidelining two of its own long-serving appointees for the occasion. Cardinal Joseph Zen Ze-kiun, the outspoken, blogging, 86-year-old retired archbishop of Hong Kong, had recently flown to Vatican City to personally plead the case of the two bishops to the pope himself. How nettlesome. He was shoved off, and has since been called an “obstacle” to a deal between the Vatican and Beijing. The reasons the Holy See is caving to the (atheist) Communist government are not entirely transparent, but it appears to be hoping for a historic thaw. Diplomatic ties were severed in 1951, not long after the Communists came to power in China, and relations have since been testy at best. One major conflict between the two governments has been the method for appointing bishops: Traditionally a prerogative of the papacy, Beijing has steadily tried to usurp it in China. The deal that the Vatican currently seems to be seeking would likely formalize some joint vetting procedure. Rapprochement could also give the pope, nominally at least, ultimate authority over all the Catholics in China — a standing, however symbolic, that may well matter to a Vatican that is losing ground to other Christian denominations among Chinese converts. The total population of Christians in China has grown considerably, from about 4 million in 1949 to perhaps as many as 100 million today. In relative terms, however, Catholics are falling behind. By some estimates, whereas Catholics in China outnumbered Protestants by 3 to 1 in 1949, today Protestants outnumber Catholics by 5 to 1. A major explanation for the increasing differential is that the Roman Catholic Church wields not only religious and moral authority, but also political and diplomatic power. The Catholic Church has a relatively unified command structure, a well-defined ideology and a disciplined organizational backbone. It has global reach and mass appeal, commands great loyalty and has long demonstrated the ability to survive and expand, all on the merits of peaceful soft power. In each of these ways, it rivals, perhaps even bests, the C.C.P. And so, naturally, the C.C.P. sees Chinese Catholics’ allegiance to the pope as a direct challenge to their allegiance to the party. Vatican City is also, still, among the 20 states, all small, that recognize Taiwan diplomatically. Like his predecessor, the current Anglican archbishop overseeing Hong Kong and Macau is a member of the Chinese People’s Political Consultative Conference, a body including luminaries that supposedly advises the C.C.P. but often promotes the party’s interests informally or clandestinely. Both men have tended to support Beijing’s restrictive reading of democratic freedoms in Hong Kong and opposed the pro-democracy Umbrella Movement of 2014. Representatives of other faiths have gone further. A vice president of the Buddhist Association of China called President Xi Jinping’s speech to the Chinese Communist Party’s 19th Congress last fall, “the Buddhist sutra of the current age.” Buddhists in China — who are variously said to number between more than 100 million to more than 240 million — have been treated with a relatively light hand by the party, at least if they are not of the Tibetan kind. Yet even if brown-nosing seems to pay off, the Vatican’s appeasement of the Chinese government would have great downsides, for itself and for the rest of the world. 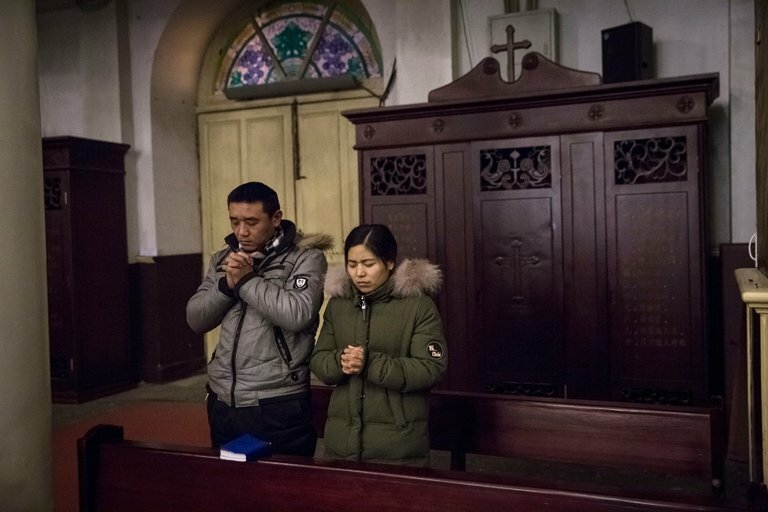 By recognizing China’s so-called patriotic church, the Vatican could harm the wholesomeness of Catholic teachings in the country. Sermons given in government-sanctioned churches already have been known to exclude passages of the Bible deemed politically subversive (like the story of Daniel) or to include Communist Party propaganda. Millions of faithful Catholics in China might also soon feel abandoned, perhaps even betrayed, after having suffered decades of oppression. Worse, the government, emboldened by the deal, could well come down even harder on them. In fact, the religious regulations that recently came into effect include much stiffer fines on underground churches and penalties for public-school teachers who give Sunday-school lessons on their own time. And then, rapprochement might augur the Vatican’s readiness to eventually stop recognizing Taipei and instead recognize Beijing as truly representing China. Such a shift would alter the delicate balance of power across the Taiwan Strait, as well as harm Taiwan’s vibrant democracy. It would also confer legitimacy — and with the pope’s imprimatur! — on authoritarian regimes throughout the world that crack down on churches and sects. The Catholic Church already has a checkered record dealing with fascist or totalitarian states. Pope Pius XII was criticized for betraying the Jews of Europe during World War II: Hewing to what he described as a position of neutrality between the Nazis and the Allies, he never denounced Hitler’s Final Solution. After Soviet forces violently repressed the Hungarian uprising in 1956, the Vatican sidelined the outspoken anticommunist Archbishop József Mindszenty in favor of a deal with the new puppet regime. The Vatican’s eagerness to play catch-up in China today may do it no favors either. Beijing doesn’t have much of a reputation for honoring commitments. Just look at its application of the “one country, two systems” arrangement it promised Hong Kong, which was supposed to guarantee the city a large degree of autonomy until 2047. Even under the deal the Vatican seems to want, the Chinese government could eventually come to control the Catholic Church in China — by, say, simply delaying nominating anyone for bishop or repeatedly rejecting candidates presented by the Vatican until all the bishops previously selected by the pope have retired or died out. Bishops ordain priests and so without bishops, in time there could be no priests, or very few, and Catholicism in China would have died a silent death. Four decades ago, when a destitute China was emerging from deep Maoism, Western companies got tipsy at the mere notion of selling deodorant to two billion Chinese armpits. Now that average Chinese have much more disposable income, major international corporations are willing to hand over proprietary technology, stoically endure violent xenophobic outbursts and take on members of the Chinese Communist Party as senior managers rather than risk losing out on the business prospects. No one, it seems, can resist the lure of the great market of China, for deodorants, cars — or congregants. Not even the Vatican. “This sort of political/economic analysis is an embarrassment to the Holy See.” Not for a communist Vatican. February 7, 2018 (CatholicCulture.org) – If Rome will be preparing for the canonization of Pope Paul VI later this year, only the most hardened ideologues could suggest that this year is the right time to scuttle his heroic encyclical, Humanae Vitae. Come to think of it, maybe the blessed Pontiff—who has already shown his intercessory clout with two miracles involving unborn children—could now intercede to protect the perennial teaching of the Church, which he championed at a great personal cost. 1 Response to No one, it seems, can resist the lure of the money available in the great market of China, for deodorants, cars — or congregants. Not even, or especially in these days, the Vatican. Bergoglio is the false prophet.